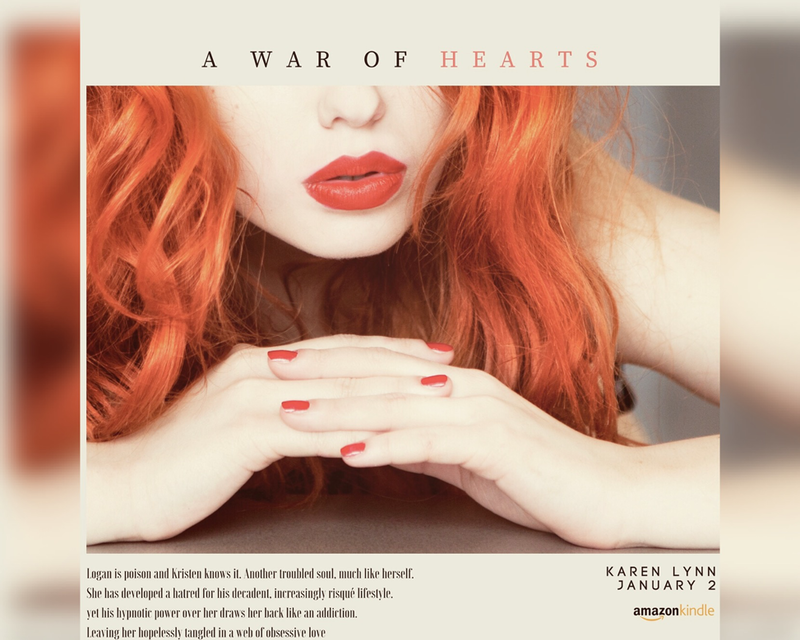 A War of Hearts is the debut novel in the series of the same name. 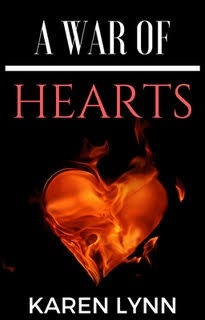 A dark romantic suspense story, it is also a psychological drama and intense and deeply emotional character study. Set in NYC and Miami, it revolves around the unintentional love triangle of three conflicted, complex and very flawed people. Kristen, a successful paralegal, consumed by desire to keep the passion that once burned in her 12-year marriage from dying. Logan, her husband, too handsome for his own good. Rich and powerful, he is never satisfied and finds himself regressing further and further into the dark, deviant lifestyle he craves. Then we have Jake, handsome, rugged, fiercely loyal, running from the demons of his turbulent past. Jake is determined to leave his dead-end bartender job and make it as an artist. He also dreams of finding true love, having a family, settling down and rebuilding his life. The emotional roller coaster ride commences. On the verge of a mental breakdown, Kristen impulsively runs from her job to take refuge in an isolated part of Central Park. Not very wise, but by this point she has had it with Logan’s craziness and is beyond reasoning. Despite being haunted by the need to make the break before it destroys her life, she finds herself facing some major obstacles. Decisions have never been easy for Kristen, especially when it comes to ones of the heart. This one is proving to be impossible. First, there is that mysterious unbreakable bond with Logan. And, then there is that seemingly insignificant fact that no one understands. She is obsessed with him. Of course, life is never simple or predictable. Its Jake’s 30th birthday. All he wants is one day of peaceful meditation in his favorite spot in the park. Is it fate or bad luck that it also happens to be a few feet away from Kristen’s hideout? A chance encounter, instant, burning attraction, mutual desire for love and devotion, all bind Jake and Kristen together in a powerful way. Jake falls hard, hopelessly trapped and in way over his head. There’s no denying Kristen’s intentions are pure; her love for Jake overpowering. So why is she in a constant state of turmoil and indecisiveness? And Logan? He cannot fathom the thought of losing. Ever. Fueled by raging hate for his unlikely new competitor, there is no limit to his madness. Two men driven by the love of one woman. Jake will die for her. Logan will kill for her. Get your copy today for just $2.99 on Amazon, Kindle, Free on KU and paperback. **But It doesn’t end here. The startling cliff hanger leads into book 2, A Sea of Smoke. Because where there is love, there is also pain, jealousy and dark obsession. And sometimes, vengeance is the only answer! Here’s what a few of the 5 star reviewers had to say. As her eyes darted around the small, sparsely furnished apartment, her body tensed. The intense chemistry she felt from the time they spoke on the phone that morning, all the way through lunch, up until the moment they entered his place, was replaced by mysterious apprehension. There was no doubt in her mind she wanted him, but at the same time fear was brewing. What if he’s like Logan, or worse? Why was she really here? Jake, while pretending not to be watching, dropped the beer bottles onto the coffee table. She was glued to the door, her body rigid, her eyes two huge gleaming green globes filled with a strange mixture of terror and uncertainty. Not sure how to handle it, he decided to take a casual approach and moved with caution, as close as he felt wouldn't seem threatening. But she still couldn’t edge away from the sense of security the door provided. "Hmm. So why are you still standing there?" It was an innocent question. He made a point not to stare her down. When she considered it, she shrugged, aware she had no idea. It just felt safe. He didn't want to intimidate her with laughter, but couldn't hide the twinkle in his eyes. "Well, you can come in and sit down any time you feel comfortable. I would never hurt you," he promised, keeping his voice hushed, almost as if he were thinking aloud. She bit her lip, then grinned. Without a word, she strolled to the couch. Tossing aside a couple of t-shirts, she gingerly sat down, reached for the beer and took several long gulps. When she was satisfied, her nerves were somewhat under control, she leaned back, keeping the bottle nearby, and watched him. This is awkward. Jake tried to remain calm, but it was hard to ignore the intense desire he had for her. Trying not to let his gaze linger too long for fear he would lose control and freak her out even more, he downed a beer.